How do we define ourselves? Are we the sum of the habits we repeat every day? Are we defined by our families, or the interests we pursue, or by our contributions to society? The answer is different for everyone—each individual soul is rich and complex. As a passionate, family company, we believe our organization also has a soul. And that soul is personified by our instructors. Ambitious, driven tech lovers with a passion to help others, our instructors have walked the STEM road and now hope to guide those who follow. Perhaps our instructors are those we met at a job fair. Or maybe they attended one of our summer programs as campers and returned as instructors years later. Either way, the steps they have taken to build the life they wanted brought them together at iD Tech. While individual paths are unique, what do our instructors have in common? They want to make the world a better place. No joke and no small task, but our instructors see each student as the next great innovator—the one person to solve a major problem that faces our world, our tech, or even our species. Hope is at the heart. They hope that an epiphany will inspire campers to see they are truly incredible and powerful…that their ideas can change the world. The one thing all campers can expect, though, is that every instructor believes they have the inner workings of someone incredible—who can in fact change the world. Why not? Thus, our instructors have the distinct honor of introducing students to the tech tools they can use to go about doing so. They see beyond the course title. Of the many noble pursuits studied at camp that are necessary to sustain modern life—robotics, code, design—instructors see the art of it. From a line of code, they see something that breathes life into a new artificial intelligence, or the opportunity to develop a way to solve hunger, cure disease, or end poverty. From a video game, they see a great story told through art and emotion. From a robot, they see the ability to do things no human alone can do, and the design skills to create all of these things. Instructors see beyond the course title to appreciate and explore the true beauty and power of technology. They help turn ideas into tangible, real-world projects. Every instructor wants to contribute a verse. 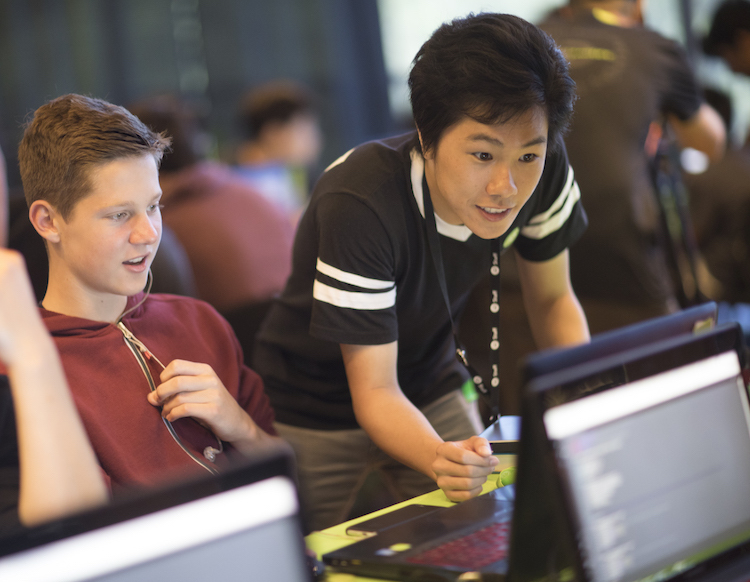 The “iD” in iD Tech stand for “internal drive,” and it is that drive and motivation that helps instructors find the context of a student’s passion. Thus, they are motivated not only to help build wonderful ideas, but to also drive them to action. It leads to the best moments at camp, moments when students realize, “Yeah, I can do this.” These moments of clarity are about so much more than just understanding how to use new software or hardware. They’re about tapping into that limitless potential we all possess, and realizing that BIG things are possible. Our instructors help our students find their verses—the part of STEM that resonates with them most—and then find ways to directly apply that resonance. Whether that’s turning a love of coding into a student’s first app, turning a drive to take photographs into a trending Instagram account, or turning a curiosity about electrical engineering into wearable tech, our instructors hear the verses our students want to contribute, and help them speak through tech. It’s a valid question…much of what is taught at camp is done with the goal of helping students along the way as they approach high school, internships, college, and careers. To start, at the end of every camp session, a ceremony is held to celebrate what has been learned and created. Families attend and gather around as instructors share student progress and projects. It’s the culmination of the entire session’s process. But importantly, there is also a focus on what can come next. And while “next” is unique to each and every student, who better to send students off than the instructors who have walked that path before them? Every instructor is an example of where your student can go, from the camp director doing research as a student at Stanford to the professional game designer instructing at Rice University, from the educators who return to camp every summer to the brand-new engineer starting her role at Google in September. Every instructor was in the same spot your child will soon find themselves—just one step away from finding their passion and making an impact. The instructor’s measure of success, then, is holding themselves accountable for just how well they’ve prepared that student for the immediate journey ahead. So to answer the question, who are our instructors? They are the people changing the world…by enabling the next wave to do the same.